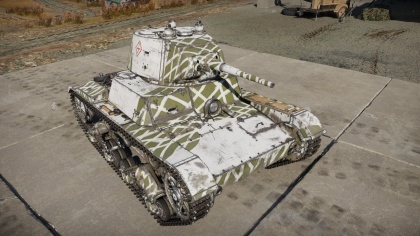 While being a light tank, its mobility is one of a medium. It will carry you where you want to be, provided you choose your route well and avoid tricky manoeuvres. Reverse speed, while not great (-6 km/h), can save you from some bad situations, provided cover is not too far behind. This is definitively the worst characteristic of this vehicle: armour is flat and thin on all sides. Do not expose yourself to enemy fire. 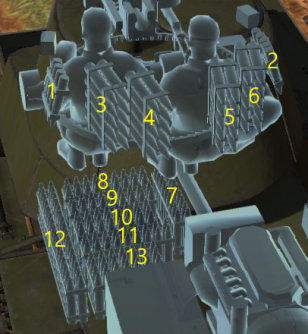 Crew placement is not lined up from the front, meaning shells without HE filler can take up to 3 shots before being destroyed. Beware HMG and autocannons. The 20-K is the typical Soviet rank 1 gun, players should get used to it since it will be your main armament up until rank 2. This gun has a good amount of HE filler, meaning penetrating shells will do good damage, sometimes even one-shot enemies. In longer ranges, shells begin to lose penetration and accuracy: it is not made for sniping. Try to bring ~10-15 BR-240SP (pure AP shells) for heavier targets. This gun is very forgiving to beginners since it has very fast reload speed and turret traverse. Ammo racks of the T-26. The ammo rack is difficult to destroy. Thin armour compared to the PzKpfw II Ausf.C. Tall profile compared to the PzKpfw II Ausf.C. The T-26 light tank was a design is derived from the British Vickers 6-ton tank. In early 1930s, a Soviet buying committee traveled to Britain and purchased tanks, tractors, and cars for use in the Soviet Union, of which the Vickers tank was chosen. Fifteen Twin-turreted Vickers tank arrived into the Soviet Union in May 1930, equipped with only machine guns. Four more Vickers were delivered at the end of 1930, these being the single-turret variants with a 47 mm gun, and the deliveries were finished by 1932. The Vickers-produced tanks were designated as the V-26. The Vickers 6-ton tank competed with several Soviet designs for the "most suitable" tank design for Soviet use. One such competitor was the Soviet T-19 light tank, which had advantages over the Vickers design, but also disadvantages. 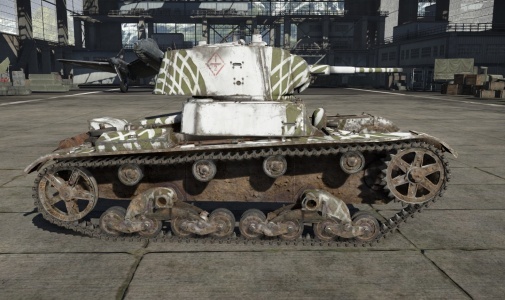 The T-19 designer, S. Ginzburg, suggested for a "hybrid" tank to be built off the features of the T-19 and the Vickers tank. But in January 1931, intelligence picked up that Poland bought up many foreign tanks from Britain and France with license to mass-produce them. As Poland was considered an enemy to the state, the pressure caused by this intelligence caused the Soviet military council to adopt the foreign tanks into Soviet usage, thus the Vickers 6-ton tank, under the designation as the T-26, was accepted into service in February 13, 1931 as the main-stay of the Red Army's armoured forces. Although outclassed later in the war, it was considered one of the more successful and widely produced tank model in the 1930s. It, along with the BT light tanks, composed of the majority of Russia's armoured forces in late 1930s. It weighed just a little under 10 tons, had 15 mm thick armour in front, with a 45 mm 20K gun , and had a crew of three people. The Bolshevik Factory in Leningrad was the first factory to start producing the T-26 from June 1931, and production of the tank lasted from then until 1941. During its production life, many variants of it was made for different purposes, up to 53 different ones to fit different roles, though only 23 would see service in production. Such designs included changes like a twin-turreted version (some with only machine guns and some with cannons), command tanks, added armour, artillery tanks (such as the T-26-4), flamethrower tanks, remote-controlled tanks, or just armoured carriers to tow artillery and such. Others were simply modified variants of the normal variants such as the T-26E, which was the base single-turreted T-26 design with 30-40 mm applique armour made during the Winter War, which made them more resilient to the Finnish anti-tank weapons. All these tanks produced in the span of 1931 to 1941 made up a total 10,300 tanks, and 1,701 other variants of it, for a total of 12,001 units produced. The T-26 first saw combat in the Spanish Civil War, where it showed its superiority over the current tanks of the period fielded by Italy and Germany. Then it saw combat against the Japanese in the Soviet-Japanese border conflicts at Lake Khasan and Khalkhin Gol, which exposed some of the design defects such as poor armour welding and the disadvantages of riveted constructions (the rivet would break off and could harm the crew inside). After that, the T-26 saw service in the Invasion of Poland and the Winter War against Finland. The Winter War effectively showed the Soviets that the T-26 was obsolete, as the 37 mm guns and anti-tank rifles and Finnish have could penetrate the light armour of the T-26. When World War II for Russia finally broke out in Operation Barbarossa, the T-26 proved inferior to the German's Panzer IIIs and Panzer IVs, plus the air supremacy of the Luftwaffe ensured many tanks were lost in the opening stages of Barbarossa. The T-26 at this point also were breaking down and the lack of spare parts made repairs hard, resulting in multiple T-26 units also being knocked out for being irrecoverable. The T-26 was gradually phased from service by the new, venerable T-34 medium tanks, which gave Germany a run for their money. 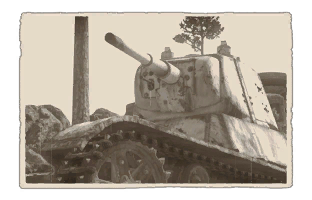 The T-26 still saw service in the war as a second-line unit, as it was still fighting in the Battle of Moscow of 1941, Stalingrad of 1942, and in Manchuria in 1945. Some T-26 even saw action in the 1st Guards Tank Brigade (1st Gv.T.Br. ), but these were quickly replaced by the more venerable T-34. A number of survivors exist today in different museums, about 45 of them are still intact. A majority of them are in Russia, Spain, and Finland, where they saw most of their services. Right side of the T-26, which shows the insignia of the 1st Guards Tank Brigade.